The rigid suitcase protects from shock, and conveys the sense of substantial equipment and physical attachment. The large form factor means a screen that’s actually watchable, and could be shared with others. Internal speakers create a fully-integrated multimedia experience, in contrast to the endless attachments portable media players require. 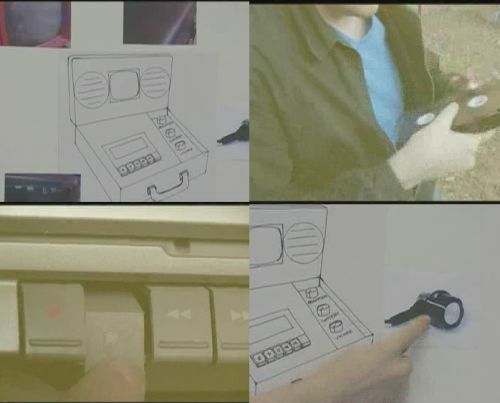 Analog video means easier scrubbing forward and backward via onboard controls. Settings like brightness and contrast have dedicated controls rather than being hidden in menus. Real knobs provide tangible feedback. Onboard analog output ideal for visualists and live mixing. Tapes create a physical connection to ephemeral media as an object. He probably taped it off of TV instead of tithing Apple. Dude. It’s a video case. VHS playback in a briefcase. Anyone got a briefcase they’re not using so we can build this thing? We already know portable VHS makes you super-happy so you do jazz dance at sunset on the beach.